What if we create a cliffhanger activity and actually measure how many kids want to continue? In just one hour kids create their 3D characters, start to program and play with the early version of their game. Big question: are they hooked enough by the programming that they go home and finish their game? You may wonder if creating their own 3D shape, e.g., the frog, is just a waste of precious programming time. The data speaks a clear language. A sensational 65% of participants do continue. The retention of students is higher than with other activities simply providing artwork for kids. 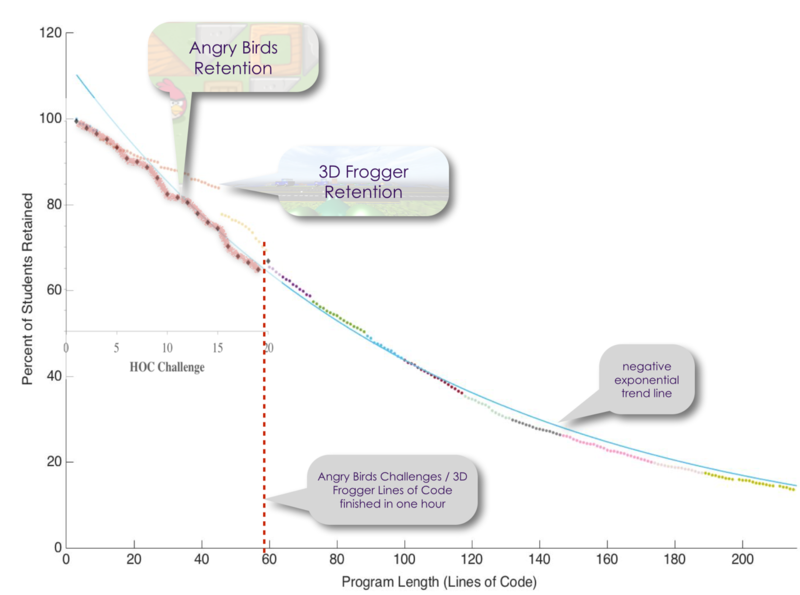 Here is a published paper showing how we measure Retention of Flow and here is a paper comparing the 3D Frogger activity to the Angry Birds Hour of Code activity.